Digital disruption is at the heart of all the conversations I have with CEOs today. And this is not surprising, as it presents the most significant threats and opportunities any of us have faced in business. When assessing the implications, consider the fact that that new digital business models are the principal reason why just over half of the names of companies on the Fortune 500 have disappeared since the year 2000. And yet, we are only at the beginning of what the World Economic Forum calls the “Fourth Industrial Revolution,” characterized not only by mass adoption of digital technologies but by innovations in everything from energy to biosciences. We are seeing the Fourth Industrial Revolution emerge in a series of waves: the digital consumer, who enjoys more interactive and personalized experiences thanks to SMAC (social, mobile, analytics and cloud) technologies; the digital enterprise, which leverages SMAC technologies to optimize the cost of corporate functions and to transform enterprise collaboration for greater productivity; and the emerging digital operations wave, where companies are truly revolutionizing business with the use of artificial intelligence, robotics, cognitive computing and the Industrial Internet of Things. These waves explain why one third of Accenture’s revenues today derive from digital services. The rapid pace and scale of disruption is unique to the Fourth Industrial Revolution. Digital companies can reach new customers immediately and at virtually zero marginal cost. They can compete in new sectors by collaborating with peers and competitors. They can massively improve quality and productivity by converging technologies and sources of data. Accenture and Airbus are trialing smart glasses that combine data from the cloud, augmented reality and 3D viewing to transform the quality, productivity and safety of workers on the factory floor. Business leaders tell me that they are intent on disrupting before they are disrupted. They want to drive value from data in new ways, and they are embracing a world of rapid experimentation that allows for the ability to innovate faster. Success is no longer about changing strategies more often, but having the agility to execute multiple strategies concurrently. And success requires CEOs to develop the right leadership capabilities, workforce skills and corporate cultures to support digital transformation. Turning to society, the implications of the Fourth Industrial Revolution are profound – from saving lives to creating jobs to better stewardship of the environment. In fact, the societal gains from digital transformation could be one to two times the value of the benefits to industries themselves, and even greater in some sectors. There will be challenges, however. We believe that the net impact on employment will be positive and that artificial intelligence will augment what humans are great at and make them even better. But we need a revolution in skills and a transformation of organizations if we are to reap these rewards in the workplace. We must also make collective efforts to establish guidelines and regulations that maximize the societal benefits. Businesses could be more incentivized to assess the social impact of their digital investments. More demanding standards could ensure consumers and citizens have confidence in business models that depend on the sharing of their personal data. Mandates on technologies like vehicle telematics would accelerate the adoption of in-car insurance and other services that reward safer driving. The breadth of digital’s impact shows that this is not merely a challenge to be delegated to chief digital officers and others. It represents more than a commercial opportunity. The Fourth Industrial Revolution demands that CEOs take responsibility for the massive transformation of their businesses and for the extraordinary impact that this transformation will have on wider society. 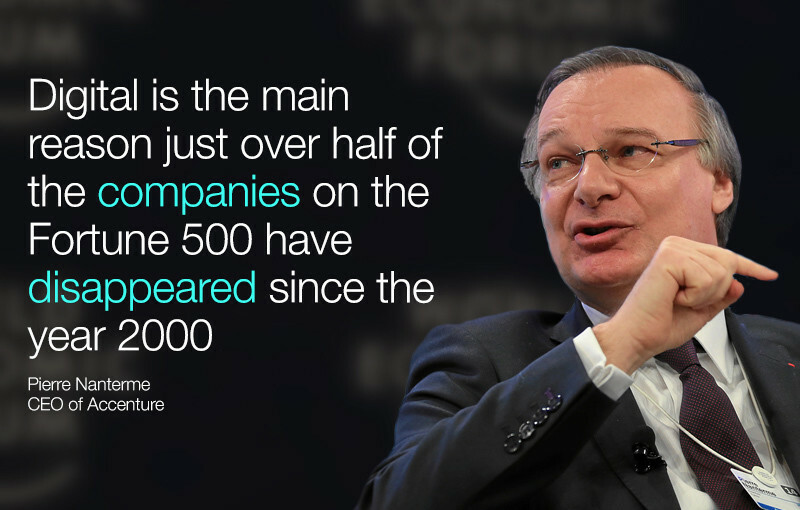 Author: Pierre Nanterme is the CEO of Accenture. He is participating in the World Economic Forum’s Annual Meeting in Davos.